Leaked images of Google's Android TV gaming controller appear online | What Hi-Fi? Images of the controller were found by a Reddit user in a directory within the Anrdoid L Developer Preview build. 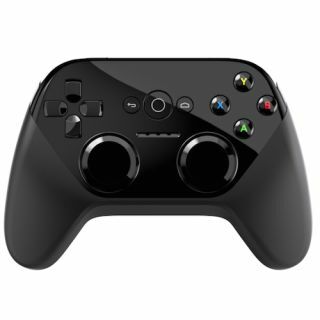 Images of the rumoured Android TV gaming controller from Google have appeared online, with a Reddit user discovering them in a directory contained within the Android Developer Preview build software. One image shows the controller in full (above), and there are more detailed pictures of parts and the insides – but only the full image has been shared publicly. A second image (below) showing the packaging has been shared on Google+ by Android Police. Google demonstrated Android TV and its gaming potential at its annual I/O conference last week. From the presentation, we learned that one user could be playing an Android game on the TV with a controller, while a second player could join the same game but using a tablet as a controller. The controller that was used with the TV in that presentation wasn't shown in full, and it's believed that it wasn't one that Google has produced itself. Android TV is Google's smart TV platform. It will come installed on Philips, Sony and Sharp TVs soon – though other manufacturers are expected to include it in the future. The platform will allow users to access the Google Play Store, along with other third party apps such as video streaming service Netflix. Acer and gaming-hardware manufacturer Razer are said to be producing Android TV set-top boxes. With the confirmation that there will be a gaming controller, it's likely the Razer-produced unit will be gaming focused.